Make sure to visit our Privacy Center for more information. Thanks for using ScootPad! We're glad you're here, but there are some rules you need to agree to before you use our website and services ("Services"). When we use the word "Services," we mean not only the ScootPad.com website and the mobile version of the website (the "Site"), but also all the other websites, products, services and applications owned, controlled or offered by ScootPad and its affiliates (for example, the ScootPad Android app available via the Android Marketplace, and the ScootPad iPad apps available at the Apple App Store). If you have any questions, comments, or concerns regarding these Terms or the Services, please contact us at info@ScootPad.com. If you are a school, district, or teacher, you represent and warrant that you are solely responsible for complying with COPPA. You are responsible for understanding how any Publisher Software (defined and described below) that you install on behalf of yourself or other users may collect and use information of users of ScootPad's Services. If you are a teacher, you represent and warrant that you have permission and authorization from your school and/or district to use the Services as part of your curriculum, and for purposes of COPPA compliance, you represent and warrant that you are entering into these Terms on behalf of your school and/or district. First, you have to sign up for an account (valid Email Address is required), and select a password . You promise to provide us with true, accurate, complete, and current registration information about yourself. You represent that you will not select a name that you do not have the rights to use or another person's name with the intent to impersonate that person for your ScootPad User ID. In certain situations, your ScootPad User ID may be selected for you by your school or district; the same rules apply to them when they select a ScootPad User ID for you. You may not transfer your account to anyone else without our prior written permission. You represent and warrant that you are of legal age to form a binding contract (or if not, that you have received your parent's or guardian's permission to use the Services and your parent or guardian has agreed to these Terms on your behalf, as we described earlier). If you are agreeing to these Terms on behalf of an organization or entity (for example, if you are an administrator agreeing to these Terms on behalf of your district), you represent and warrant that you are authorized to agree to these Terms on that organization or entity's behalf and bind them to these Terms. You promise to only use the Services for your personal, internal, non-commercial, educational use, and only in a manner that complies with all laws that apply to you. You also represent that you are not a person barred from receiving our Services under the laws of the United States or any other applicable jurisdiction. If your use of the Services is prohibited by applicable laws, then you are not authorized to use the Services. We cannot and will not be responsible for you using the Services in a way that breaks the law. If you do not comply with the foregoing conditions, or we reasonably suspect that information provided by you is in violation of the foregoing conditions, we have the right to suspend or terminate your account and refuse any and all current or future use of our Services (or any portion thereof). We assume no responsibility for the timeliness, deletion, mis-delivery or failure to store any user communications or personalization settings. You are responsible for obtaining access to our Services, and that access may involve third-party fees (such as Internet service provider or airtime charges). If you use your mobile device to access or use our Services, you understand that you are responsible for any fees that your mobile service provider charges for data or SMS services. In addition, you must provide and are responsible for all equipment necessary to access our Services. It is your responsibility to maintain the confidentiality of your password. If you use our Services, you agree to accept responsibility for all activities that occur under your account or password. You agree to notify us immediately of any unauthorized use of your account or if you feel your password has been compromised, or for any other breach of security. To better maintain account security, be sure to sign out from your account at the end of each session. We cannot and will not be liable for any loss or damage arising from your failure to comply with this section. While we do allow children to use our Services, we only sell products to adults who can make purchases with a credit card or using PayPal. Any users under the age of 18 may only make purchases with the involvement of a parent or guardian. We reserve the right to refuse service, terminate accounts, remove or edit content, or cancel orders at our sole discretion. If you feel that your account has been compromised, contact us immediately at info@ScootPad.com. The basic ScootPad user account is free - that is, we don't charge for signing up for a ScootPad account. We offer licenses for parents, individual teachers and schools/districts which grant access to all our features and services. To review all available licenses and their pricing, please visit our Pricing page. From time to time, we may offer additional products and services for purchase. We reserve to create, modify or remove each subscription service and any other products and services at our sole discretion. Teachers can receive credits towards future classroom license fees ("Referral Credit") through teacher referrals. In order to receive credit, a teacher must first be registered to use ScootPad. To receive Subscription Credit through a referral, a teacher (the "Referring Teacher") can refer another teacher who does not already have a ScootPad account (the "New Teacher") to ScootPad. When the New Teacher signs up to use ScootPad, we conduct a verification process before the Referring Teacher receives a credit. First, the New Teacher must follow the Referral Link sent by the Referring Teacher to sign up. 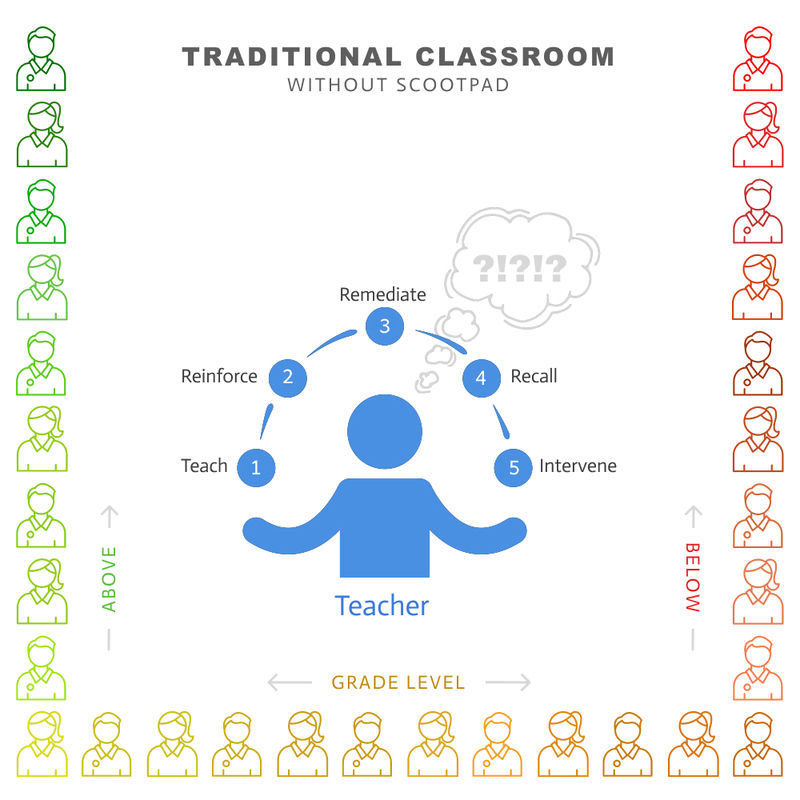 Second, ScootPad will verify the New Teacher's account for two things: (a) to ensure the New Teacher has not signed up for ScootPad previously; and (b) to monitor the account for "Valid Activity", which means that the New Teacher will have added real student accounts and have completed practices (1000 problems solved in total). 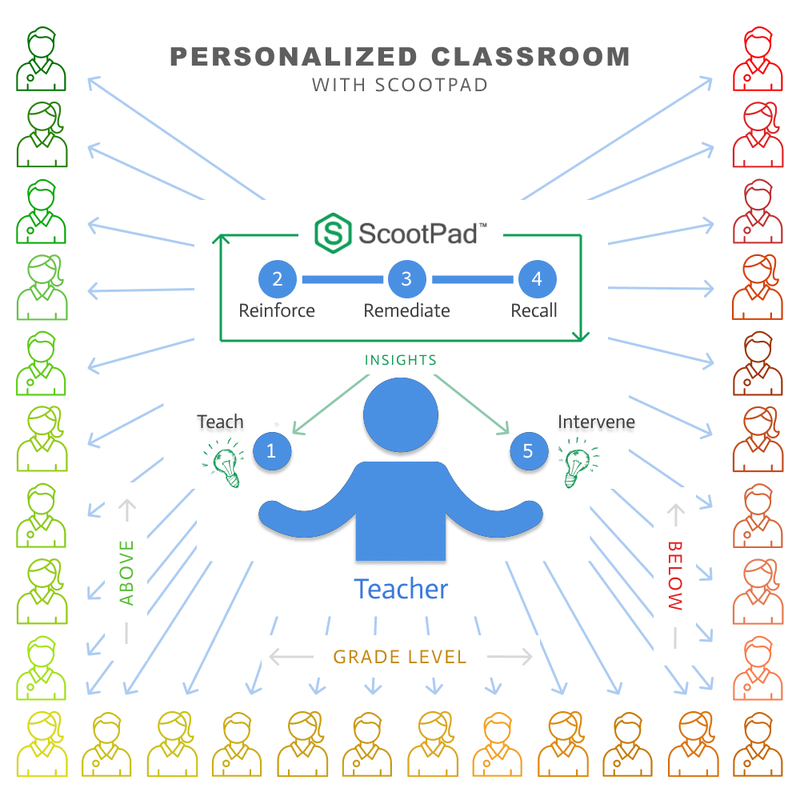 Once the verification process is complete and the above requirements have been met, ScootPad will add a credit of $10 to the Referring Teacher's account. We reserve the right to create, modify or remove any of the above terms relating to Referral Credits at our sole discretion. We currently do NOT offer refunds for our Site License or Subscription services. We reserve the right to change our refund policy at our sole discretion. The compilation of all content on the Site is the property of ScootPad and is protected by U.S. and international copyright laws. All software used on the Site is the property of ScootPad or its software suppliers and is protected by U.S. and international copyright laws. "ScootPad.com" and others are our service marks or registered service marks or trademarks. Other products and company names mentioned on the Site may be trademarks of their respective owners. ScootPad's service marks, trademarks and trade dress may not be used in any manner that is likely to cause confusion among customers or in any manner that disparages or discredits ScootPad or www.ScootPad.com. All other trademarks not owned by ScootPad or its subsidiaries that appear on the Site are the property of their respective owners, who may or may not be affiliated with, connected to, or sponsored by ScootPad or its subsidiaries. Our website may include statements concerning our operations, prospects, strategies, financial condition, future economic performance and demand for our products or services, as well as our intentions, plans and objectives (particularly with respect to product and service offerings), that are forward-looking statements. These statements are based upon a number of assumptions and estimates which are subject to significant uncertainties, many of which are beyond our control. When used on our Site, words like "anticipates," "expects," "believes," "estimates," "seeks," "plans," "intends," "will" and similar expressions are intended to identify forward-looking statements designed to fall within securities law safe harbors for forward-looking statements. Our website and the information contained on the Site does not constitute an offer or a solicitation of an offer for sale of any securities. THIS SITE IS PROVIDED BY SCOOTPAD ON AN "AS IS" AND "AS AVAILABLE" BASIS. SCOOTPAD MAKES NO REPRESENTATIONS OR WARRANTIES OF ANY KIND, EXPRESS OR IMPLIED, AS TO THE OPERATION OF THIS SITE OR THE INFORMATION, CONTENT, MATERIALS, OR PRODUCTS INCLUDED ON THIS SITE. YOU EXPRESSLY AGREE THAT YOUR USE OF THIS SITE IS AT YOUR SOLE RISK. TO THE FULL EXTENT PERMISSIBLE BY APPLICABLE LAW, SCOOTPAD DISCLAIMS ALL WARRANTIES, EXPRESS OR IMPLIED, INCLUDING, BUT NOT LIMITED TO, IMPLIED WARRANTIES OF MERCHANTABILITY AND FITNESS FOR A PARTICULAR PURPOSE. SCOOTPAD DOES NOT WARRANT THAT THIS SITE, ITS SERVERS, OR E-MAIL SENT FROM www.SCOOTPAD.com ARE FREE OF VIRUSES OR OTHER HARMFUL COMPONENTS. SCOOTPAD WILL NOT BE LIABLE FOR ANY DAMAGES OF ANY KIND ARISING FROM THE USE OF THIS SITE, INCLUDING, BUT NOT LIMITED TO INDIRECT, SPECIAL, INCIDENTAL OR CONSEQUENTIAL DAMAGES (INCLUDING DAMAGES FOR LOSS OF BUSINESS, LOSS OF PROFITS, LITIGATION, OR THE LIKE), WHETHER BASED ON BREACH OF CONTRACT, BREACH OF WARRANTY, TORT (INCLUDING NEGLIGENCE), PRODUCT LIABILITY OR OTHERWISE, EVEN IF ADVISED OF THE POSSIBILITY OF SUCH DAMAGES. THE NEGATION AND LIMITATION OF DAMAGES SET FORTH ABOVE ARE FUNDAMENTAL ELEMENTS OF THE BASIS OF THE BARGAIN BETWEEN US AND YOU. THIS SITE AND THE PRODUCTS, SERVICES, AND INFORMATION PRESENTED WOULD NOT BE PROVIDED WITHOUT SUCH LIMITATIONS. WE AND OUR AFFILIATES SHALL NOT BE LIABLE FOR ANY LOSS, INJURY, CLAIM, LIABILITY, OR DAMAGE OF ANY KIND RESULTING IN ANY WAY FROM (A) ANY ERRORS IN OR OMISSIONS FROM THE SITE OR ANY SERVICES OR PRODUCTS OBTAINABLE FROM THE SITE, (B) THE UNAVAILABILITY OR INTERRUPTION OF THE SITE OR ANY FEATURES OF THE SITE, (C) YOUR USE OF THE SITE OR WITH THE DELAY OR INABILITY TO USE THE SITE, (D) THE CONTENT CONTAINED ON THE SITE, OR (E) ANY DELAY OR FAILURE IN PERFORMANCE BEYOND OUR CONTROL. THE AGGREGATE LIABILITY OF US AND OUR AFFILIATES IN CONNECTION WITH ANY CLAIM ARISING OUT OF OR RELATING TO THE SITE, OR THE PRODUCTS, SERVICES OR INFORMATION PROVIDED BY THE SITE SHALL NOT EXCEED $100 AND THAT AMOUNT SHALL BE IN LIEU OF ALL OTHER REMEDIES WHICH YOU MAY HAVE AGAINST US AND OUR AFFILIATES. ANY CAUSE OF ACTION YOU MAY HAVE WITH RESPECT TO THE SITE OR ANY PRODUCTS OR SERVICES PURCHASED USING THE SITE MUST BE BROUGHT BY YOU WITHIN ONE YEAR AFTER THE CAUSE OF ACTION ARISES OR BE FOREVER WAIVED AND BARRED. You agree to indemnify, defend and hold us and our partners, agents, officers, directors, employees, subcontractors, successors and assigns, third party suppliers of information and documents, attorneys, advertisers, product and service providers and affiliates harmless from any liability, loss, claim and expense, including reasonable attorney's fees, related to your violation of the Site Policies or use of our website. By visiting www.ScootPad.com, you agree that the laws of the state of California, without regard to principles of conflict of laws, will govern the Site Policies and any dispute of any sort that might arise between you and ScootPad or its affiliates. Any dispute or unresolved controversy arising out of or relating to the Site Policies, your visit to www.ScootPad.com or to products you purchase through the Site shall be submitted to confidential arbitration under the auspices of JAMS in San Francisco, California, except that, to the extent you have in any manner violated or threatened to violate ScootPad's intellectual property rights, ScootPad may seek injunctive or other appropriate relief in any state or federal court in the state of California, and you consent to exclusive jurisdiction and venue in such courts. The arbitrator's award shall be binding and may be entered as a judgment in any court of competent jurisdiction. Each party will bear its own costs with respect to any disputes arising under the Site Policies. To the fullest extent permitted by applicable law, no arbitration under the Site Policies shall be joined to an arbitration involving any other party subject to the Site Policies, whether through class arbitration proceedings or otherwise. The language in the Terms shall be interpreted as to its fair meaning and not strictly for or against any party. The Terms, together with any purchase orders or contracts with you and your information may be automatically assigned by us in our sole discretion to a third party in the event of an acquisition, sale or merger. Should any part of the Terms be held invalid or unenforceable, that portion shall be construed consistent with applicable law and the remaining portions shall remain in full force and effect. To the extent that anything in or associated with the Site is in conflict or inconsistent with the Terms, the Terms shall take precedence. Our failure to enforce any provision of the Terms shall not be deemed a waiver of such provision nor of the right to enforce such provision. Our rights under the Terms shall survive any termination of the Terms. Have a question about privacy or terms?